Why Take a Independent Birth Class Rather Than a Hospital One? Have I mentioned how awesome it is to meet the wonderful women I get to meet working with Birth Boot Camp? This has literally been a life changing opportunity for me. I have been doing weekly guest posts from natural birth teachers that I have had the opportunity of training. This week the post is from somebody who has actually YET to do her training. But she is so excited about teaching Birth Boot Camp that she wanted to share her thoughts already. You know you have a good thing going when women really can't WAIT to get out there and start teaching it. Some thoughts from Shazia- Future Birth Boot Camp teacher! How is Birth Boot Camp different? After hearing several expectant moms complain that the cost of Birth Boot Camp was too high, I decided to investigate why they were hung up on the cost of around $295 (depending on if you take an online class or a live class). I paid about the same for my birth education and never thought it seemed high for everything that I was getting. I couldn't figure out why some moms thought the price was too high for the services they were receiving. Then I realized that most of the moms were comparing Birth Boot Camp to a hospital birth class. I think some moms are being misled by the name of the series. 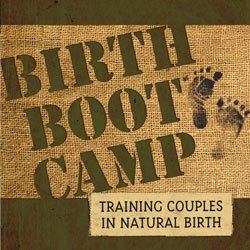 Make no mistake, Birth Boot Camp IS an extensive series that will fully prepare couples for birth, BUT Birth Boot Camp provides so much more than "just a birth class." I compared Birth Boot Camp to some classes offered at a local hospital close to my home and the prices were comparable for the education received. The class that covers just birth at the hospital was around $100. However, in order to even come close to the amount of material covered in Birth Boot Camp, you would have to take several classes at the hospital. You would need to take the pregnancy class, the birth class, the breastfeeding class, the newborn care class, and the "daddy" class at the hospital to account for the same amount of time and material covered by Birth Boot Camp. All said classes come to a total of around $220 at the hospital. Birth Boot Camp is not that much more expensive. What is the difference? That is an excellent question! When you sign up for all of these classes at the hospital, you aren't getting the quality that Birth Boot Camp provides. You don't know who will teach the course, you don't get to bond with your instructor and the same couples each class, and you don't even know what curriculum they are teaching. With Birth Boot Camp, you get to choose your instructor. You get to know your instructor, and they will forever be in your life offering education, support, and encouragement. I still speak to my birth educator and my son is 15 months old. She provides me with ongoing support and encouragement. She was a tremendous help during the postpartum period and even helped with breastfeeding issues. Without her in my life, I wouldn't be the mom that I am today. I knew before signing up for her course who she was and that she had "been there." I knew that she had 4 children and had achieved the type of birth that I desired. When you sign up for a course at the hospital, you don't know anything about your instructor. You don't even know if they have had children and if they have children, you don't know what their views on birth are. With a Birth Boot Camp instructor, you know they have all had a natural birth and successfully breastfed for at least 12 months. You also know that they are truly passionate about what they are teaching and want to help you achieve a natural birth and successfully breastfeed your baby. For couples who take a live birth class, they get 10 weeks of classes with the same couples that are at roughly the same stage of their pregnancy. Opportunities for moral support and lifelong friendships are lost when you take five or more different classes at the hospital. Finally, hospitals are businesses. The more interventions you have, the more money they make. If you desire an intervention free birth, do you really think the hospital will teach you what you need to avoid money making interventions in their birth class? Birth Boot Camp is designed for any couple birthing in or out of the hospital to achieve a natural birth. Many medical and birth professionals worked hard to develop up to date and informative curriculum to prepare you and your husband for pregnancy, birth, breastfeeding, and raising your baby. You get what you pay for. Birth Boot Camp is worth every penny. Other classes just don't compare. Sorry, but as a hospital based natural childbirth teacher who works like crazy and sticks my neck out on the line all the time to make my class one that is worth taking and prepares moms for natural childbirth, I am sick and tired of articles like this that trash on my classes based simply on who owns the walls around them. Try promoting your program WITHOUT trash talking and stereotyping the instructors you know nothing about! The post stated I was comparing BBC to local hospital classes in my area. There is not a single birth class offered at any hospital in my area specifically for couples who desire a natural, intervention free birth. Perhaps your area is different, and if so that is great! If you are teaching a hospital class using evidence based birth practices and informing women that the healthiest birth for their baby and for themselves is a natural one, keep up the good work. More hospitals could use educators like you. Unfortunately, many women I know have taken a hospital birth class, ended up with a traumatic birth experience, and felt let down by the education they paid for. There is no quality natural childbirth option available for a bargain that is a comprehensive class intensively covering birth, pregnancy, breastfeeding, and parenting in any hospital within miles of me. Sad, but true. I also thought I should add that one local hospital offers a Lamaze style class and included in the course is an "anesthesia lecture."